Posted by Travis Veigas & filed under Blog. Executing a sign program for your facility is just like any other design-construction project: you need common sense and a good plan. In addition to determining their general education and experience, you need to be sure you will be working with qualified signage design professionals and not with self-taught “graphic artists” or sign illustrators. The process of designing a sign program is rigorous, and involves more than visual aesthetics. Make sure the firm you hire knows the difference between simple illustration drawings and detailed design drawings. A proper sign program documentation package used to solicit competitive bids must include 4 items: design drawings, sign location plans, written material/performance specifications, and a sign message schedule. Require examples. 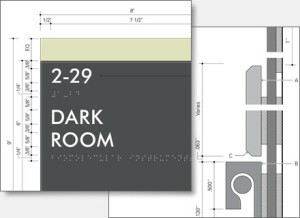 Beware of the tendency of some sign design firms to limit the level of detail on their drawings to “design intent” only. This is an effort to avoid design responsibility for ease or practicality of fabrication. Sign design drawings should accurately convey construction feasibility as well as visual design intent. There is more than one way to manage communications on a project – but you need to know in advance what approach your designer intends to adopt. Some firms will pass communication responsibilities from a marketing staffer, to a design coordinator, and then on to a construction administration manager. Other firms will designate a single individual to oversee the project from beginning to end. The important thing here is to confirm the consultant has thought carefully about this process. 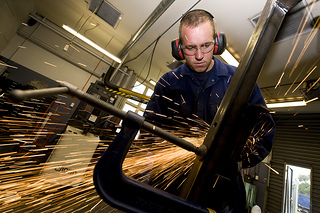 How well do you work with fabricators? The idea here is to confirm that your consultant has a strategy for interacting with sign fabrication companies during the design phase of the project. Designers should be encouraged to solicit technical advice, samples, material recommendations, and other information from fabricators. At the same time, care should be taken to manage the expectations of the fabricator with regard to preferential consideration during the vendor selection process, especially if the project is to be competitively bid. This issue is complex. A collaborative relationship between designer and fabricator is essential on any signage project, but the integrity of your vendor selection process must also be maintained. You are best served by a design consultant who takes an open and transparent approach to interacting with fabrication companies. You’ll want to have a sense of the implementation budget as early in the process as you can. Find out when the designer will explore the cost implications of the design concepts, and when will they deliver a budget estimate for implementation of the project. Find out how accurate, in general, are the budget estimates – is this something that the firm has tracked on past projects? Request details. Developing and implementing an effective sign program for your facility is not rocket science, but it is specialized. If your selection of a design leader doesn’t hit the mark, the process is likely to deteriorate into a tangle of missed deadlines, over-designed signs, excessive cost, and mediocre product quality. On the other hand, if you choose your design consultant carefully, your prospects for getting the results you want are significantly improved. First, it would be helpful if your site were more easily readable. Light gray type on charcoal background — not a good example of design! I would add a sixth question to the five excellent questions you pose. What is the firm’s experience and knowledge with ADA requirements? Accessibility is not only important for a great number of the people who will be visiting or working in the facility, but it is the law, and sensitivity to the law is, after more than 20 years, increasing. You place your client (the owner) at risk if you don’t understand its importance, and are not willing to find an aesthetic solution that is also compliant and provides universal access.